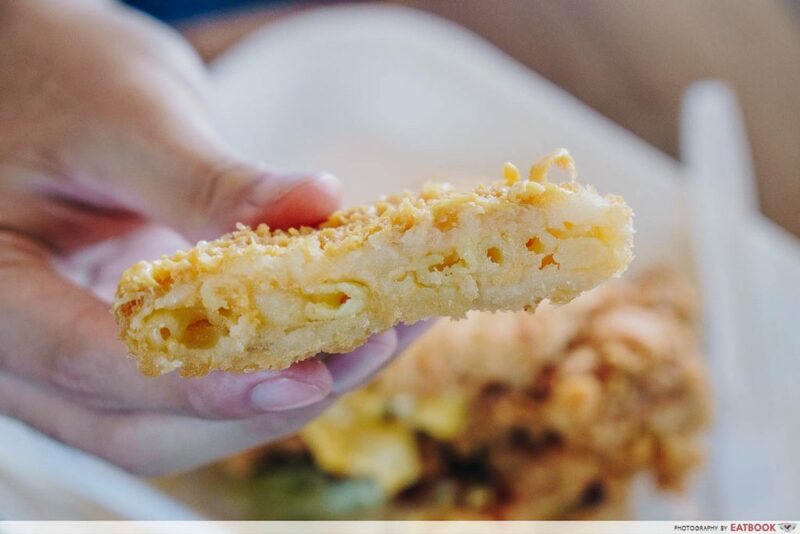 The next time you’re planning to Netflix and chill, be sure to give KFC a call because you def’ want to get your hands on their new Mac ‘N Cheese Zinger. Available from 13 February 2019, this cheesy creation may just earn the title of being the most decadent fast food dish in town. 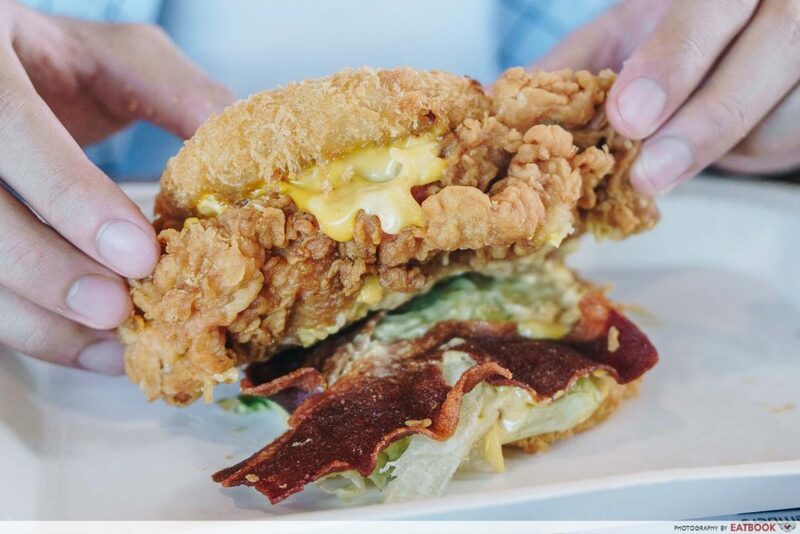 Comfort food at its best, the zhnged-up Zinger burger swaps the usual sesame seed buns for deep-fried mac and cheese patties. Fried until crisp, the breaded golden brown patty opens up to reveal compressed elbow macaroni pasta in creamy cheese. 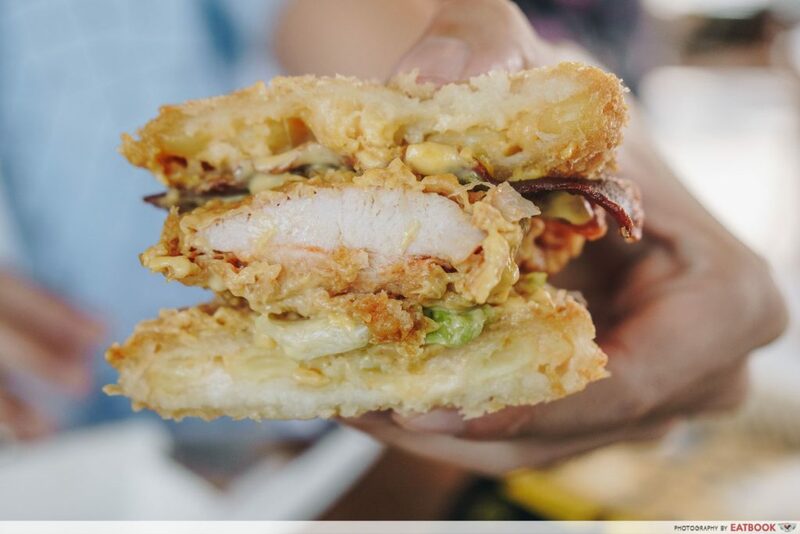 And if that’s not indulgent enough, the Mac ‘N Cheese Zinger also comes stacked with crispy turkey bacon as well as a generous slather of their signature KFC cheese sauce. Lettuce is also added in to help balance out the richness of this sumptuous burger. All this together with the crunchy, succulent slab of chicken fillet, makes for a hearty feast we will gladly unbutton our jeans for. Get it as a meal, which comes along with a side of regular-sized whipped potato and Pepsi, at $8.95. 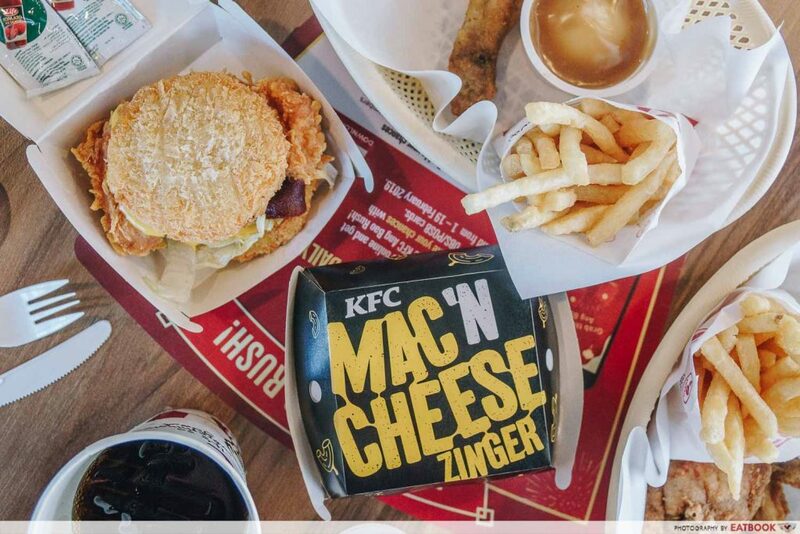 Alternatively, share the love with bae this Valentine’s Day and order the KFC Mac ‘N Cheese Zinger Box ($10.95). The box comes filled with the scrummy burger, a piece of fried chicken, regular-sized fries, whipped potato and Pepsi. 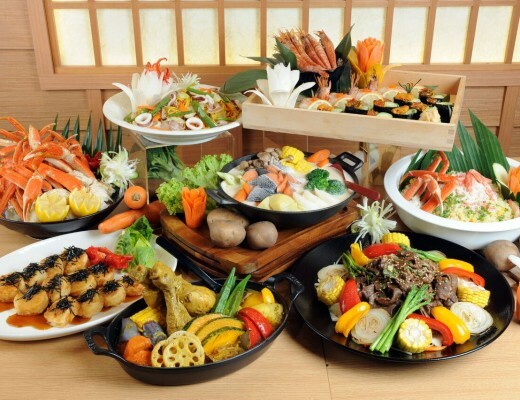 Of course, if you have a huge appetite, you can enjoy the entire box on your own. Judging by how delicious their Mozzarella Zinger Burger and Parmesan Truffle Chicken were, we are certain this new burger will be finger-lickin’ good too. 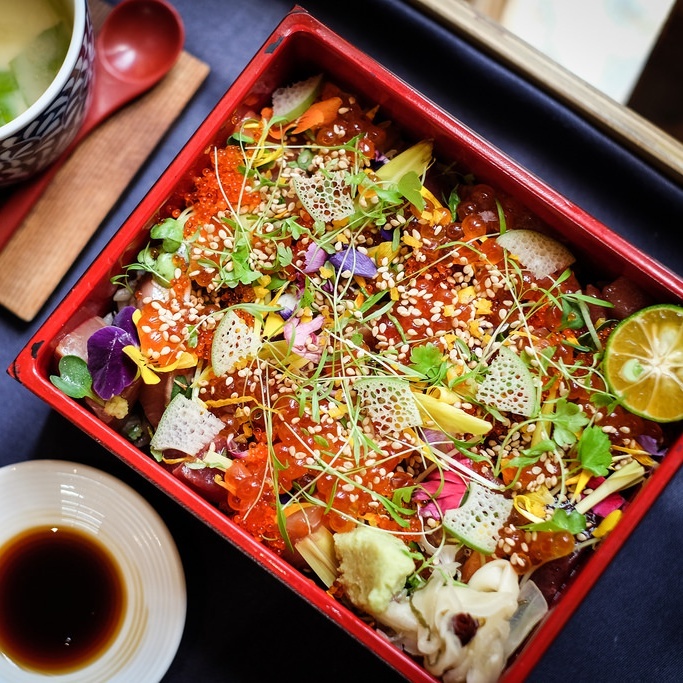 If you can’t wait until 13 February to sate your mac ‘n cheese cravings, head to Five Oars Coffee Roasters for their creamy mentaiko mac and cheese! 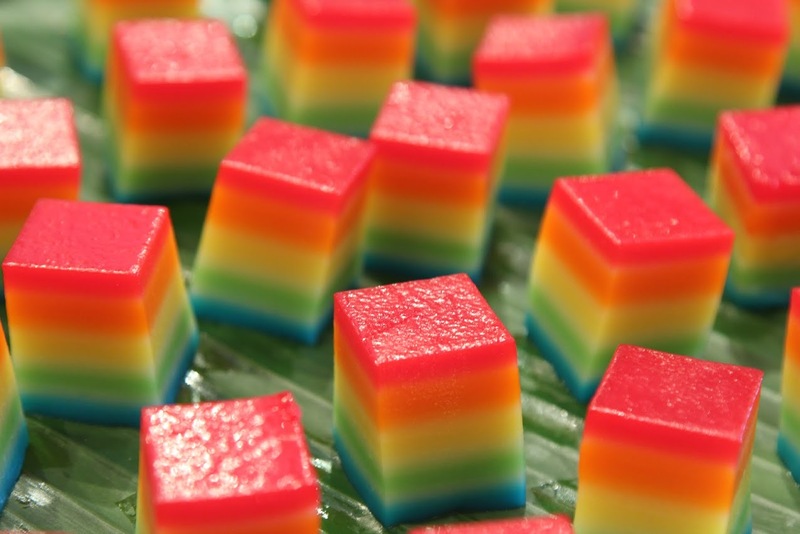 Photos taken by Angeline Ngiam. This was a media tasting at KFC Singapore.